People walk near the Washington Monument, with the U.S. Capitol in the background, Dec. 26, 2018, as the partial government shutdown continues in Washington. A shutdown affecting parts of the federal government threatens to carry over into January. Museums and galleries popular with visitors and locals in the nation’s capital will close starting midweek if the partial shutdown of the federal government drags on. People skate on the National Gallery of Art Sculpture Garden Ice Rink, Dec. 27, 2018, as a partial government shutdown continues in Washington. The museum and the skate rink will be closed to the public after Jan. 2 as a result of the shutdown if it continues. Smithsonian facilities are open Jan. 1. The National Gallery of Art will close starting Jan. 3, a spokeswoman said. 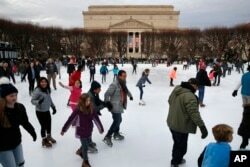 That includes the iconic West and East buildings as well as an ice rink in the National Gallery of Art Sculpture Garden that is a favorite with families. National Gallery of Art facilities are usually closed New Year’s Day. Is Shutdown a Sign of the Gridlock to Come?